DART updates its 20-Year Financial Plan every year, and balances the scope of projects to the available funding. A project scope may be adjusted to fit the budget allocated to the project through the DART Board, as well as the amount of federal funding we think we have a reasonable chance of winning based on our project proposals. The scope, project schedule, and budget for proposed projects are all coordinated with the FTA and DART service area cities through project development. DART is constructing and operating a system, not a collection of standalone projects. Each of our capital investment projects are just a piece of the larger transit network for North Texas. That means every new project is designed to strengthen the entire system, ensuring it remains interconnected and efficient to benefit the entire region. Although we depend on money allocated by DART cities and the Federal Transit Administration (FTA), and other sources, we manage our funds by anticipating market changes and ensuring we have capital funding available. DART also looks for opportunities to take advantage of new funding programs that can leverage local dollars and deliver projects in a timely manner. In 2006, DART requested and received a $700-million Full Funding Grant Agreement (FFGA) from the FTA to kick-start a $2.5-billion expansion that doubled the length of the DART rail system to reach even more areas and serve more people. 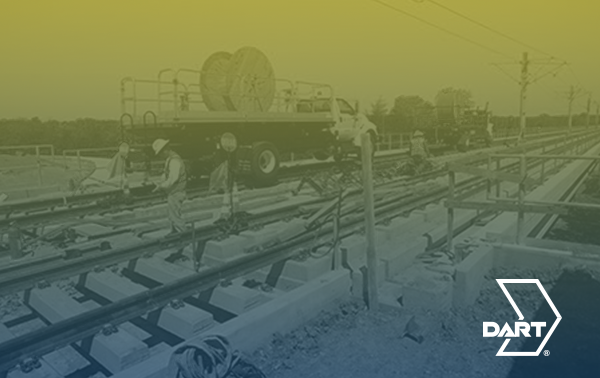 Currently, DART is seeking funding from the FTA for multiple projects, including D2, the Dallas Streetcar, and platform extensions as part of the Program of Interrelated Projects. Additionally, DART is applying for funds through an innovative federal program called the Railroad Rehabilitation and Improvement Financing (RRIF) program to finance the Cotton Belt Corridor project with a low interest loan advancing the project schedule forward by more than 10 years. Striking the right balance can be tricky, but DART is working to align the area’s needs and interests with the budget to build the best transportation network for our communities.